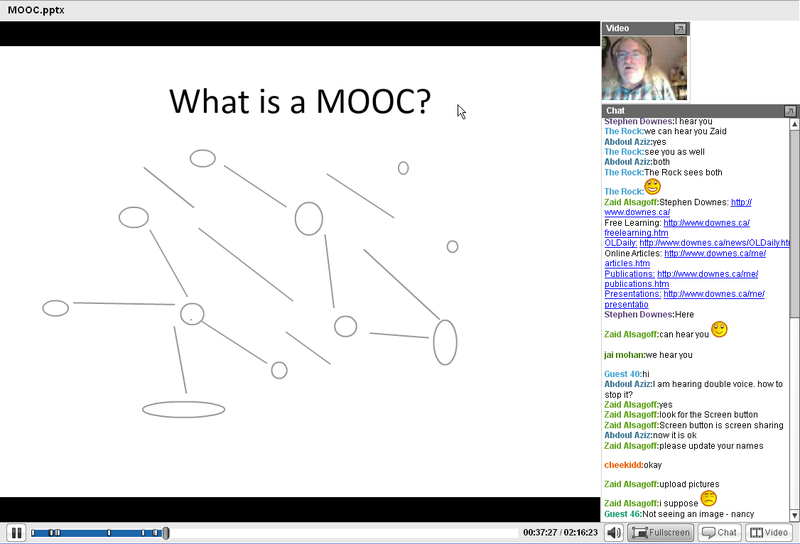 In this (nearly 2 hour online) talk Stephen Downes, one of the originators of the Massive Open Online Course (MOOC) format, described the organization and management of a MOOC, beginning with the arrangement of technology, organization of learning materials, communications with students, support tasks, and interaction with guest presenters. 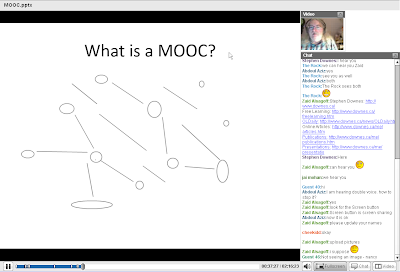 This talk is based on fifteen years’ experience designing and delivering web-based instruction, as well as knowledge amassed though the delivery of six MOOCs to almost ten thousand students since 2008. You are recommended to skip the first 30 minutes of the recorded webinar, so that you can get right into the action. The actual session starts roughly 30 minutes into the recording. If you have any problems viewing, try updating your Flash Player. Click here to download the recorded webinar. Click here for an excellent audio recording of the webinar captured by Stephen Downes. salam zaid is the recorded session to download in exe format ??? Yes, the downloadable recorded session is in exe format. We are going to publish an edited version in a week's time in a more appropriate format. This existing one, is the one WizIQ auto-constructs from the recording. Maybe you have problems because of firewall blocking. Otherwise, try restarting your computer and then see whether you can view the recorded version (try Firefox if IE or Chrome lets you down).